A mother has been left 'heartbroken' after her son died after a crash in Ringwood in the early hours of yesterday. 21 year old Jasper Collins, of Ringwood Road, Bransgore died in hospital after the crash on Crow Lane shortly before 2am. Investigations into the single vehicle crash are ongoing and anyone who may have seen what happened or saw the white Volkswagen Scirocco being driven by Jasper before the crash are asked to contact police. Contact police on 101, quoting 44170304869, or Crimestoppers anonymously on 0800 555 111. As you can imagine, we are devastated, heartbroken. No words can sum it up. Just 21 years old, now forever young." “Thank you for your kind words, they do mean so much. It helps to receive them. Jasper was truly a good boy – I would say that wouldn’t I but it is so true. Adrian and I were incredibly proud of him. So kind, cheeky, funny, and such a dear friend to so many." “I am told the pub was absolutely full all day yesterday as they gathered to be a comfort to each other. I’ve seen the videos cheering him and the flowers and the cushion Jasper made for Jack, which was so typical of Jasper’s humour." “A tragic car accident but please do know and take comfort that Jasper was asleep immediately and had no pain. I was by his side in hospital and all the staff at Southampton General Hospital were truly amazing. Our thanks to them all for all they did to try to help him." Firefighters are still tackling a large heath fire next to the A338 near Ringwood. There is currently a lane closure southbound on the A338. 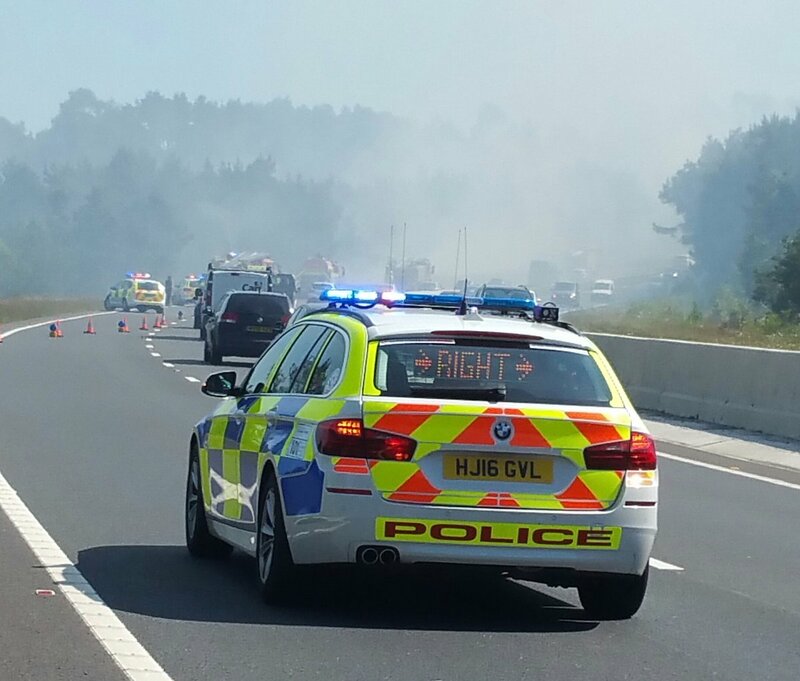 Smoke plumes are causing visibility problems for some drivers this rush hour as firefighters tackle a large heath fire next to the A338 near Ringwood. There is currently a lane closure southbound on the A338 from Ringwood. Crews remain at the scene and are making 'good progress' to bring the blaze under control. INCIDENT - We are tackling a large heath fire which can be seen from A338 Black Water. This road is expected to close shortly - Avoid area. A sixth person arrested in connection with the murder of Dorset businessman Guy Hedger been released but remains under investigation. Mr Hedger died of gunshot wounds following a raid at his home near Ringwood three weeks ago, Three men have been charged with his murder and are due to appear at Winchester Crown Court in July. A sixth man arrested in connection with the murder of Guy Hedger in Dorset has been released under investigation. A 39 year old man from Bournemouth was arrested on suspicion of conspiracy to commit aggravated burglary yesterday. Guy was shot dead by intruders in the early hours on Sunday 30th April at his home in Castlewood in Ringwood. Searches at an address in the West Howe area are continuing. All three men will appear at Winchester Crown Court in July 2017. A 40-year-old Bournemouth woman and a 45-year-old man from Poole, previously arrested in relation to the incident, have also been released under investigation. Detectives have made a further arrest this morning in the Guy Hedger murder investigation. A 39 year old man from Bournemouth has been arrested on suspicion of conspiracy to commit aggravated burglary. An address in the West Howe area is currently being searched by officers in connection with the investigation. It is believed jewellery, including designer watches, were stolen from the address. The family of Guy Hedger paid tribute to "a caring and compassionate man" who lived life to the full. Two men have been charged with the murder of Guy Hedger in East Dorset. He was shot dead by intruders at his home in Castlewood in Ringwood, in the early hours of Sunday 30th April. 41 year old Jason Baccus and 44 year old Scott Keeping, both of Verney Close in Bournemouth, were this afternoon charged with murder and aggravated burglary. A second occupant in the house at the time – who was the victim’s partner – is being supported by specially-trained officers. The family of murder victim Guy Hedger paid tribute to "a caring and compassionate man" who lived life to the full. The post-mortem examination found he died as a consequence of gunshot wounds. Both men are due to appear at Bournemouth Magistrates’ Court tomorrow, Saturday 6 May 2017. A 40-year-old Bournemouth woman and a 40-year-old man from the Blandford area continue to be questioned by detectives. “There will continue to be a heightened police presence in the area while enquiries take place and our local policing team is there for residents, should they have any concerns. A cordon remains in place at the address while crime scene investigators examine the scene." A fourth person has been arrested in connection with the murder of a Dorset businessman. Police say a man attended Bournemouth police station on Wednesday 3 May. The 40 year-old, from the Blandford area, has been arrested on suspicion of murder and aggravated burglary. In total, four arrests have been made. "Our enquiries still continue and our appeal still stands for anyone with information that could aid us to come forward. This is the case for anything relating to suspicious activity after 3am on Sunday 30 April 2017 in the Verney Close area of West Howe and in Winterborne Stickland as well as information about anyone acting unusually in Castlewood in the days or hours leading up to Guy Hedger being killed."